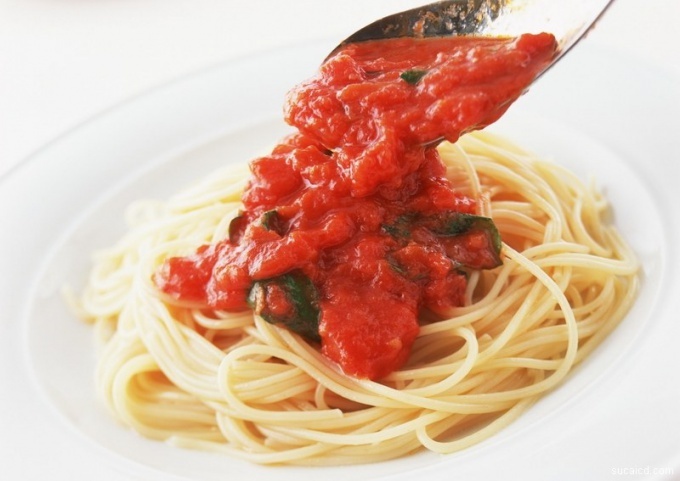 Tomato sauce – the perfect complement to meat, fish or vegetable dishes. Cooked in a special recipe of the original sauce will be the highlight of your savory treats. Cut the onions, carrots and bell pepper. Onion – half rings, carrots – cubes, the size of about a centimeter per centimeter, sweet pepper – thin rings. Walnuts grind into crumbs. In a frying pan with high sides, heat the sunflower oil. Fry the onions until slightly Golden. Be careful that the onions don't burn. Add carrots and bell pepper. Simmer until the vegetables are soft. To the vegetables add tomato paste, mix well and pour here a glass of warm water. Bring to a boil, constantly stirring the sauceto prevent it from burning. Then add salt, black pepper, curry, turmeric and cumin. Cayenne pepper use taste. If you are a thrill that will be enough to cut the top off the pod. In this mass, add chopped walnuts. When the sauce starts to thicken, it is necessary to add herbs and garlic. A few sprigs of dill and juca crush the garlic finely chop. These products need to cut a few seconds before they fall into the sauce. Otherwise they will evaporate all the flavor. Cook the sauce another minute and remove from heat. Pour into a ceramic or glass bowl. In any case, do not use aluminum cookware. In it, the sauce can be oxidized and sour. The sauce needs to steep and cool down. This original tomato sauce goes well with meat, baked in the oven, grilled chicken, meatballs, ravioli, spaghetti and pasta, rice, and other favorite dishes you.